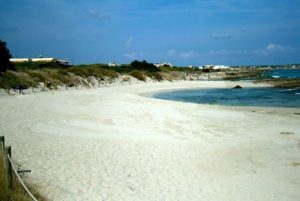 Ses Platgetes are strips of sandy beach located on the coast next to Es Calò characterized by rocky seabed and it is very popular with divers. The beach of Ses Platgetes (also known as the beach of Es Calò) is about three hundred meters from Es Calò de Sant Augustì, a small fishing village, situated opposite the slope to El Pilar de la Mola. 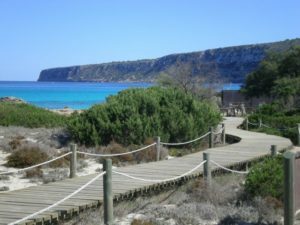 This stretch of coast, located inside a large inlet between Punta Prima and Punta de Sa Creu, is formed by a succession of three small coves and is characterized by rocky outcrops, clean beaches with white and soft sand, dune system and fixing vegetation, such as pine trees and bushes, which extends to the back. The first of these coves is a pristine sandy beach with a beautiful turquoise sea, where there is a small chiringuito called Amore & Iodio which also offers the possibility to rent parasols and beach loungers (since August 2014 it is closed). 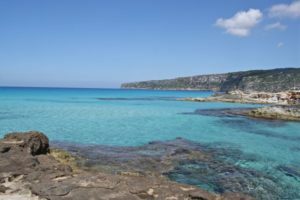 Walking in the direction of Es Calò you come to the second cove which is a natural bay with cliffs, golden sand and crystal clear waters. There are rocky bottoms that slope and for this reason it is wise to pay attention when you are about to take a bath. The third is characterized by a rocky protrusion that divides the cove into two natural pools, one of which is used by fishermen as a harbor for the traditional boats. It is probably one of the less suitable beaches for swimming because of the rocky coast and the winds that blow from the north, on the other hand is the best area where enjoy scuba diving thanks to the presence of significant aquatic animals like octopus, jellyfish and fish of varying size and color. Ses Platgetes can be reached by car in an easy manner coming to nearby village of Es Calò. If you use the scooter then you can park it on the edge of the main road that leads to La Mola and then, through a network of boardwalks well integrated with the nature, get to the beach. This beach can also be reached by public transport, indeed there is a bus stop about 50 meters away. Book online using the promotional code ESTATE123 and save with our partners. The code is valid for EVERYONE. You can take advantage of the discounts even if we were unable to provide the right accommodation for you. The portal offers a selection of houses for rent in Formentera: apartments in Es Pujols and the beautiful Villa Las Palmas with swimming pool as well as detailed guides of the island.